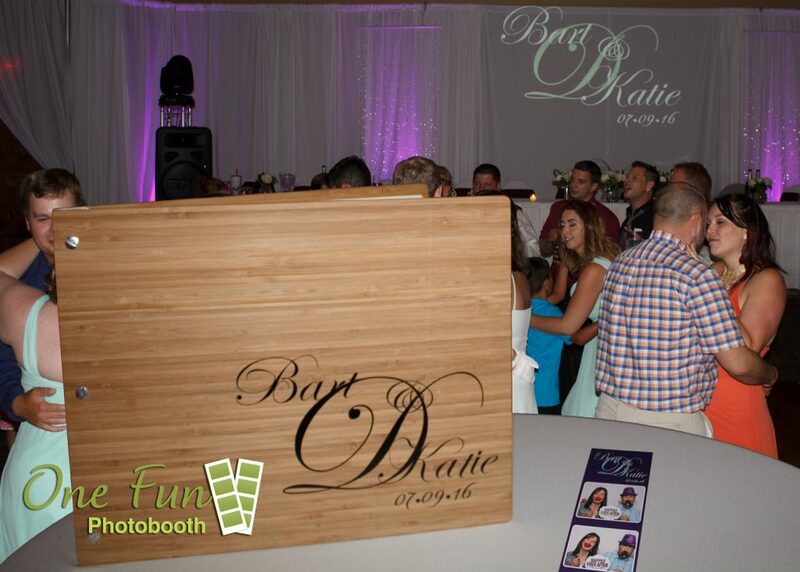 Custom Photo Guest Book and photostrip that matches Bart & Katie’s monogram giving a seamless look to the event. One Fun Photobooth loves what you love. You have spent days on Pintrest and other sites picking and choosing every detail. The colors, the style, the feel that screams you. This is not the day you want a photobooth to ruin it for you, like a sheet they claim is a backdrop and an ipad on a stick. The One Fun Photobooth team of designers and planners create a photobooth experience that matches your wedding colors, your style and feel you are looking for. If you want rustic, you get rustic, if you want modern you get modern. The photobooth experience you get flows with the celebration of your day. When your guests walk in they see a photobooth that is there, but is not THERE. The customization of your booth starts with you. Every detail from the draping, the lighting, the props, the photo memory book all the way down to the custom one of a kind photo strip that is designed just for you. This is why One Fun Photobooth is the most popular wedding photobooth in the Sun Valley and Twin Falls area and has been awarded the 2013, 2014, 2015 National WeddingWire Couples Choice Awards. Call us today and let us put create a photobooth experience for your special day.